Bug fix preventing reltrace output with hard trim. Improved skipping of low quality mixed traces. Improved support for BrilliantDye traces for the ABI 3730 instrument with the 50cm array. Bug fix to prevent output of zero length .seq files when skip short traces checked, no trimming used, and set abi limits checked. 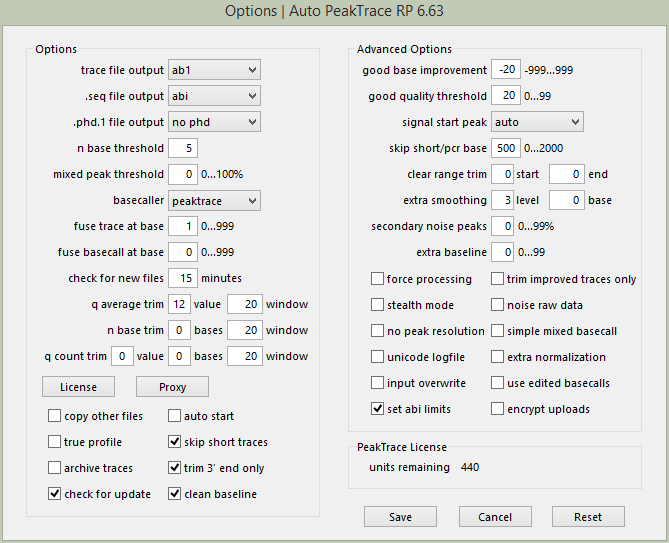 Auto PeakTrace RP 6.63 for Windows and MacOS X can be downloaded from the PeakTrace RP downloads page. This release is also available via the automatic update feature within Auto PeakTrace RP if you are currently using a recent version.